Chapter 14, in keeping with the pattern, concludes with worship in heaven. We are again reminded that neutrality in this cosmic struggle is not possible. If we are not God, then we are against Him; we cannot hide ourselves among His enemies and expect to avoid their fate in facing the wrath of God. Although this worship is happening, we are reminded in the first verse of chapter 15 that the Beast still rages upon the earth. Therefore, God, in Chapter 16, sends seven plagues upon the Beast and his cronies. As stressed with the visions of seven in the previous cycles, these plagues are not futuristic predictions, but rather warnings to move the readers to repentance. This is the common theme which Koester consistently emphasizes with reference to the plagues and displays of wrath which we find throughout Revelation. "When readers are moved to ask where their own deepest loyalties lie, the text has its proper effect" (148). The word "Armageddon" certainly conjurs wild images to the modern reader. In modern english nomenclature, the word "armageddon" is often used as shorthand for incredibly epic and potentially world-ending war involving jets and tanks and bombs and suicide donkeys. However, the name "armageddon" is a combination of two hebrew words: "har," which means "mountain" and the name "Megiddo" - a location in northern Israel. Koester notes that this combination of words is "peculiar... since Megiddo is actually located on a plain rather than a mountain." Based on the fact that John does not use Hebrew names in a literal fashion (they are almost always used symbolically), Koester points out that this Hebrew name is also symbolic. Based on the way that Megiddo occurs in the Old Testament (2 Chr. 35:22; Zech. 12:11; Judges 5:19; these are all places where enemies of the Lord are destroyed), Koester says that Megiddo is symbolic of "a place name that portends the coming destruction of the adversaries of God." Once again, observe the non-linear structure of Revelation. Just as Babylon was shattered by an earthquake in 16:19, we see it once again in chapter 17. Recall that John has a particular intention; namely to compel his readers to identify with the woman who is pursued by the beast (that being the Church). Part of his approach is to depict the enemies of God as ten-headed monsters, as prostitutes, as Beasts, as hideous creatures - not only that we might see them for what they are, but so that we would be repulsed to think that we could have partnership with them. 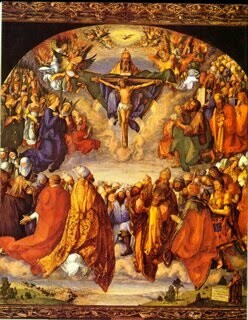 The church is depicted as "the mother of the Messiah and the faithful (12:5, 17). 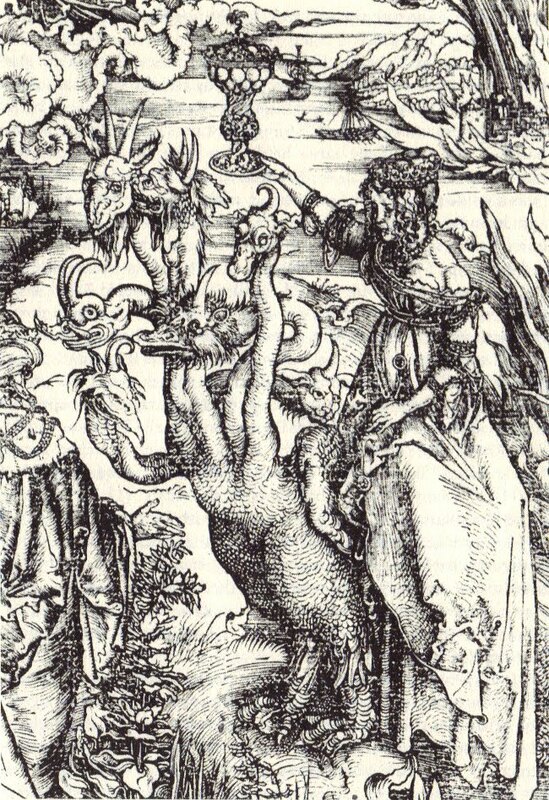 The harlot is depicted as "the mother of whores and of earth's abominations" (17:5). The church is depicted as being "pursued by a seven-headed monster." 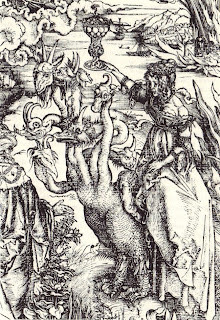 The harlot, meanwhile, "happily rides a seven-headed monster and drinks the blood of the saints (17:6)." When it comes to the somewhat confounding discussion in verses 9-14 of chapter 7, Koester discusses the difficulty interpreters have had attempting to identify who the seven kings who will share in their reign with ten lesser kings and so on. Koester chooses a rather different path by claiming that "John uses evocative imagery that resists decoding." He does suggest that "Picturing an eighth king as a return of one of the seven seems to play on legends that Nero would return, so that one could say of a future persecution of the people of God: 'It is Nero all over again'... Despite the ambiguity in its detais, the end of the story is clear. Evil self-destructs. The beast and its allies begin by waging war against the Lab (17:13-14), but they end up destroying the harlot (17:16)" (161). and so that you do not share in her plagues. As Koester points out, the right reaction to the Fall of the Harlot and of Babylon "is not fatalism, but an 'altered life.'" 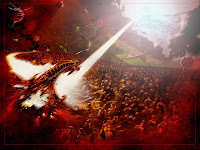 Again and again, the primary pattern we see in Revelation involves Satanic attempts to destroy the church, with God at every stage demonstrating his superiority by inflicting on the Beast and his followers plagues, disasters, and judgments of all sorts. In the face of reality, of sin, of death, of mortality, of God's obvious superiority, the fallen world continues to worship anything and everything but the God who made all things. 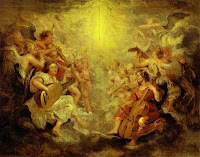 If we are confounded at the unwillingness of most of the earth's population to worship God and turn away from Satan and his idols, we need look no further than heaven, once again, to find the heavenly company singing God's praises. Again, we see "a great multitude crying out." The horrors always recede for us to see the universe as it should be, and as it will be. God's superiority is proclaimed at all times, regardless of how violently the dragon might lash out. And an even happier time lies ahead, as we prepare to witness the marriage supper of the Lamb and the millennial reign. This should be an interesting near-conclusion.